I don’t know about you, but these restaurant reviews are beginning to feel a bit monotonous, so I figured it’s time to change things up. And changing things up means a recipe post! Before I proceed with this post though, I want to advertise a new project I’m starting with this blog. I’ve long been an ardent reader, and for a while I’ve grappled with balancing my two passions: food and literature. I could never strike a decent balance between the time I devoted to the two; sometimes I’d spend more time reading, and sometimes I’d spend more time cooking. About a week ago, I had an epiphany. Reading and cooking needn’t be mutually exclusive: I can create recipes inspired by the books I read. My goal will be to post one recipe per week inspired by whatever it is I choose to read. I’m going to feature a Halloween series for the month of October, and the books will be: The Metamorphosis, The Strange Case of Dr. Jekyll and Mr. Hyde, Dracula, and Frankenstein. The first of these posts will come next week, so stay tuned! Do you ever wonder how grandmas become so sweet? I’m not talking about grandmothers… you know, the women who maintain a distant, formal relationship with their offspring. I’m talking about grandmas, the grey-haired women whose faces are decorated with laugh lines, who will almost always give you what you want. (Especially if you ask well enough.) Do grandmas want to treat their children as nicely as they treat their grandchildren? Does the degree of separation allow grandmas more patience than moms? Who knows, maybe my natural disposition just isn’t sweet enough to comprehend a grandma’s sweetness. Whatever the explanation is, I’m fully convinced that I have two of the sweetest grandmas to have ever graced the face of the Earth. You can try to argue me on this, but you probably won’t win. My maternal grandma is every bit as sweet as she is inept in the kitchen. Boxed brownies were her signature (and only) dish. Aside from that, the extent of her cooking has always been making a bowl of cereal or heating a frozen meal in the microwave. My paternal grandma (“Mamoe”), on the other hand, can make something taste better just by touching it, and it’s not often enough that I get to gorge on her cheese potatoes, chicken casseroles, and coconut pies. A couple weeks ago, when my life plans took a nose-dive into the deep end of the pool of uncertainty, she sent me a plate of one of my all-time favorite foods by way of my aunt. 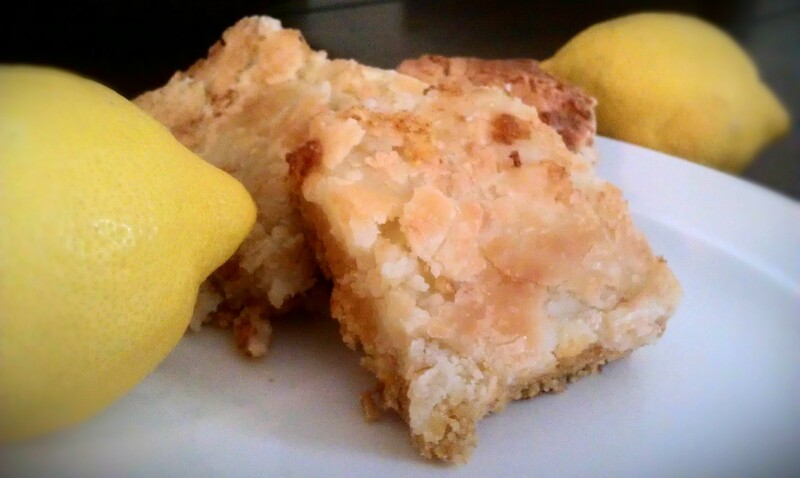 Mamoe makes these lemon squares every Christmas for her cookie platters. Every Christmas Eve, I get my very own full pan. If you ever need to find me around 10 o’clock before Santa comes, just check the couch. I’ll be in the fetal position cradling my food baby, fully incapacitated by a sugar coma. If you need to find my lemon squares… well, good luck. These bars are essentially a lemon version of Paula Deen’s gooey butter cakes, but Mamoe started making them when Paula Deen was still poor. On paper, they’re nothing incredibly special. The base is made from a box of cake mix, and the filling is little more than cream cheese, eggs, and powdered sugar. In the oven, the magic of science transforms these bars into the most perfect sticky little bites imaginable. A tissue-paper thin crust forms on top of the filling that shatters into a mosaic with your first bite. The gooeyness of the filling underneath keeps the crust glued in place, so you get a bit of the texture of the caramelized sugar in every bite. These bars are super sweet, but the lemon provides enough tartness to prevent any puckering. These lemon squares taste like both my childhood and Christmas, and eating them in the aftermath of my existential crisis (forgive the hyperbole) was beyond comforting. More comforting than the memories they evoked was the knowledge that I was eating a long-distance hug from Mamoe. This plate of lemon squares said, “I love you, I support you, and I’m here for you no matter what life throws your way.” In the face of changing my mind after embarking upon my so-called “plans for the future” and the dubiety with which I’m entering the next few years, I can say that in life, there are four things you can be sure of. Death and taxes, naturally. But also the sweetness of grandmas and food’s comforting powers. For crust: Mix all ingredients well. Dig in: you can incorporate everything better if you get your hands dirty. Pat mixture evenly into a greased and floured 9″x13″ pan. For filling: Beat cream cheese until fluffy. Add eggs 1 at a time, mixing well after each addition. Add powdered sugar and vanilla; mix well. Pour into pan over crust. Bake 20-25 minutes*. Allow to cool, then cut into squares. *The original recipe calls for 35 minutes, but we like ours gooier. When you pull it out of the oven, you don’t want the middle to be completely set and firm. It will puff up and settle as it cools. This entry was posted on October 10, 2013 by Emeliorations in Dessert.